Hey, everyone! Tis me, your local loon. I have a delicious recipe for you (do I do ANY other kind? I mean…really? Pshaw! *looks totally fake humble* 😛 ) as well as a Hamilton Beach giveaway. As you already know, I’ve been a proud ambassador for them for a couple of years now and I love their products. This is the final 2016 review and it’s one I personally love. I had a rice cooker I bought for $3.99 at Goodwill before this and sure, it worked; more or less. Problem was, all it did was rice and the way the inside lid was made, you couldn’t clean under it and there was nothing stopping condensation from getting up in there. So what did that lead to? The starches in the water from the rice would get in there and mold and every time I opened the lid, all that oh so nasty water would drip down the backside of the cooker. Not INTO the rice, but still… I was soooo ready for a new rice cooker. So what did I make? Well, I have a confession to make. 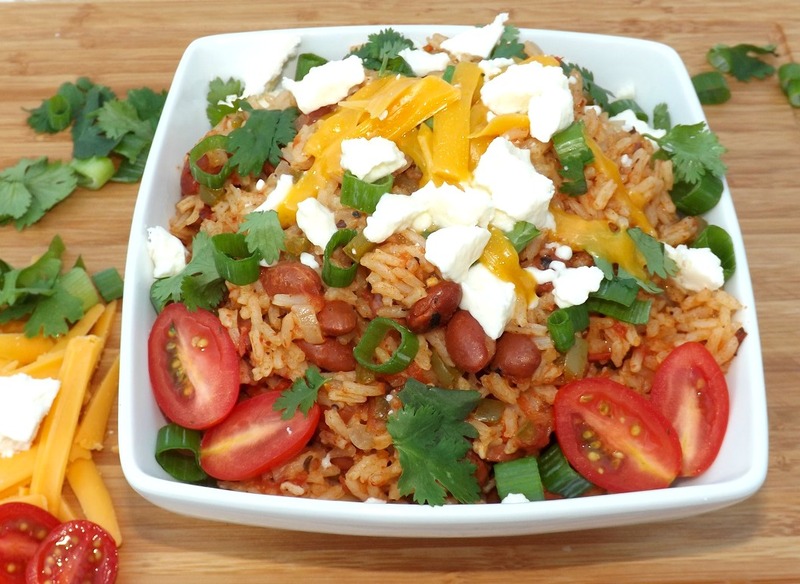 I adore pretty much any flavor of Rice A Roni with a definite weakness for both the Mexican and the Spanish ones. So, I wanted to make a rice similar to those, but without having to stand over the stove worrying that I was going to burn it. I have to say, I succeeded admirably *she again says humbly* I have one step in here outside of the rice cooker, but it can easily be considered optional. I saute the veggies for a couple of minutes with the rice, then dump it all in the rice cooker. I wanted to get rid of the raw taste of the veg, plus brown the rice a bit. But again, that step is totally up to you. 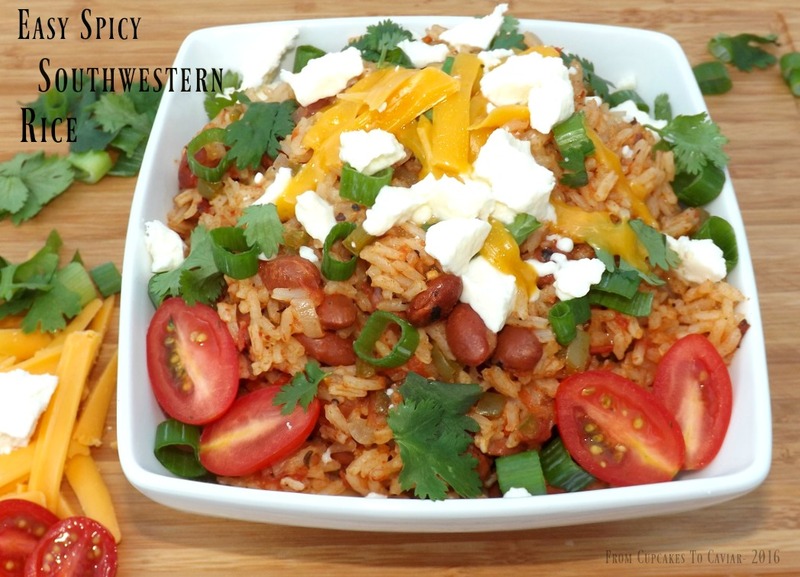 I also added a can of pinto beans cause I adore rice and beans. No matter what though, get one of these Hamilton Beach rice cookers and make this rice! Scoop all of this straight into the rice cooker. Pour the chicken broth and diced tomatoes with their liquid over the top of the rice. Add the ketchup, liquid smoke, can of drained beans, and seasoning. Give this all a few good stirs, then close the lid, set the cooker for white rice and go read a book, or do some housework (you know you prefer the book idea). When it’s done, stir it well, then spoon it into a serving dish. Garnish with sliced green onions, fresh cilantro, some chopped grape tomatoes and cheese. I used some cheddar and some queso fresco. This was so good! Hamilton Beach sent me a rice cooker for review, but all opinions in this post are 100% my own. Well, after I finished reading it, I couldn’t get out of my mind one of the dishes mentioned. 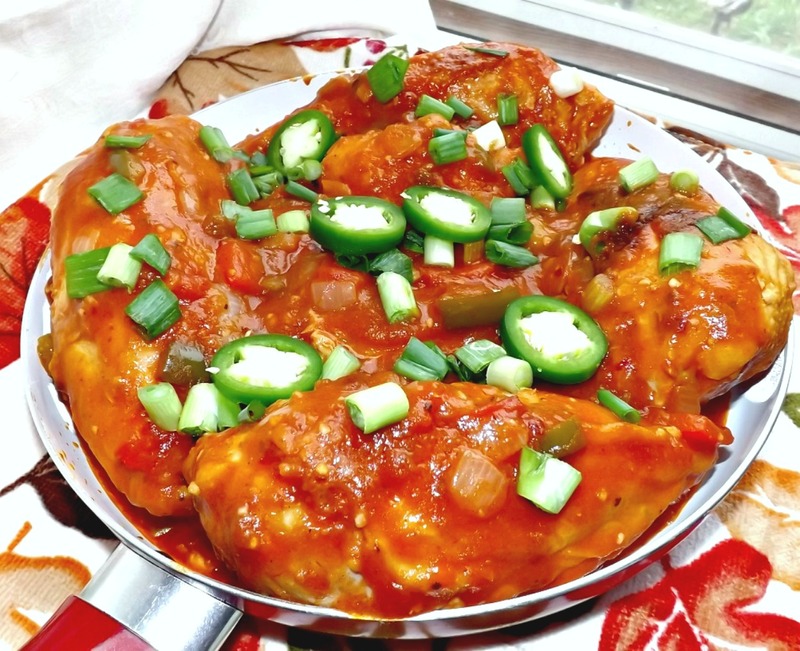 The author called it Chicken Piquante. 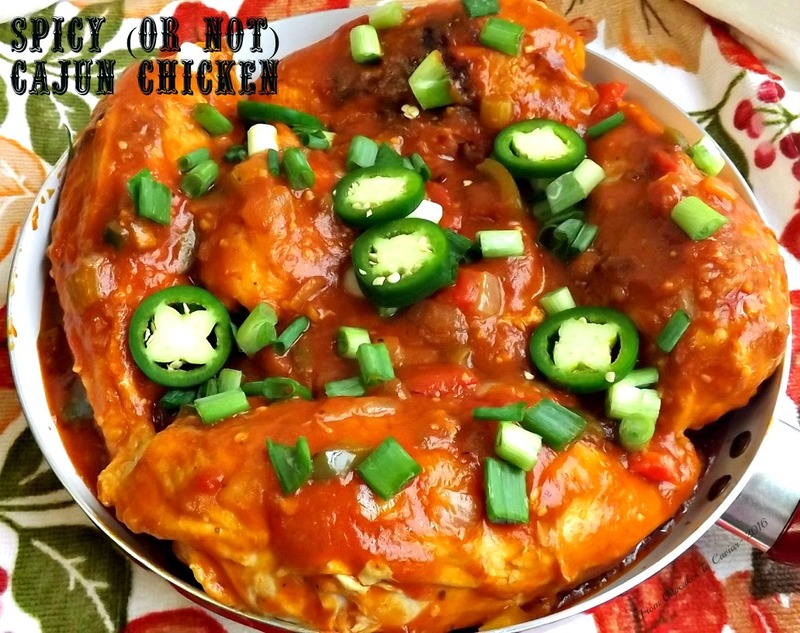 It was described as chicken in a spicy tomato based sauce that had plentiful amounts of onion, garlic, etc etc. It wouldn’t leave my head and all I could think of was that I wanted to make something like that. Pour the 2 tablespoons oil into a large pan (I used my 7 quart dutch oven just to leave room for splattering grease). Add in the chicken pieces, skin side down, doing it in two batches if they don’t fit comfortably in the pan. Cook the first side of the chicken for about five minutes. Don’t try to pull it up if it doesn’t come up easily. When meat has browned enough, it will flip without leaving half the skin in the pan. Flip each piece and let it cook for about another five minutes, then transfer the meat to a plate. Drain the grease in the pan and add in the 1/2 cup oil and 1/2 cup flour. Over medium heat, stirring frequently if not constantly, cook them together until the mixture is a medium brown color. You’re making a roux here and it will add a delicious flavor to the finished dish as well as help thicken the sauce up a bit. Once the roux is a medium brown, add in the various chopped veggies. Stir them around to coat and let them cook until softened, about 5 minutes. Garnish with green onions and sliced jalapenos if desired and serve with rice or noodles to sop up the amazing sauce. We’re well into the school year and I don’t know about you, but it seems like half the time, I’m so busy with chauffeuring here and there, plus doctors appointments for physicals and vaccinations, etc, etc, that I end up saying “it’s snack night!” to my kids when they ask whats for dinner. Then I feel guilty because what happens is they eat cereal (they’re thrilled with that; me, not so much) for dinner and everyone ends up spread out chowing down on foods that I normally prefer not be served. One will be in his room, eating sandwiches. Two will be parked in front of the TV, watching Uncle Grandpa (Lord, I loathe that show) while my husband and I will be sitting in front of our computers. NOT exactly a family friendly eating experience and NOT how I want my kids childhoods to be. My husband working third shift exacerbates the problem because half the time, after getting the kids to school, I’ll come back and lay down with him and before I know it, half the day is gone and no dinner prep was made. So what do I do more often now? Yep; you guessed it. The trusty slow cooker comes out. I own about 5 of them. The problem is, most of them are either too small or too limited on their usages (high or low, that’s it for settings) , so I let them sit and gather dust. 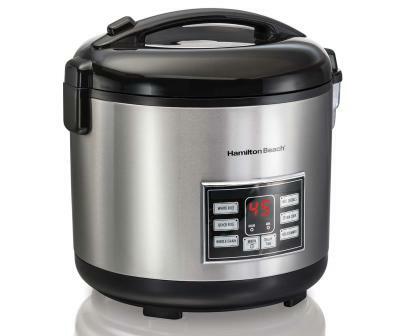 So when I was contacted again as a Hamilton Beach Ambassador and asked if I wanted to try out their Set ‘n Forget® 6 Qt. Programmable Slow Cooker With Spoon/Lid I was thrilled. Finally, I would have a slow cooker that I didn’t have to babysit. This cooker is pretty awesome. 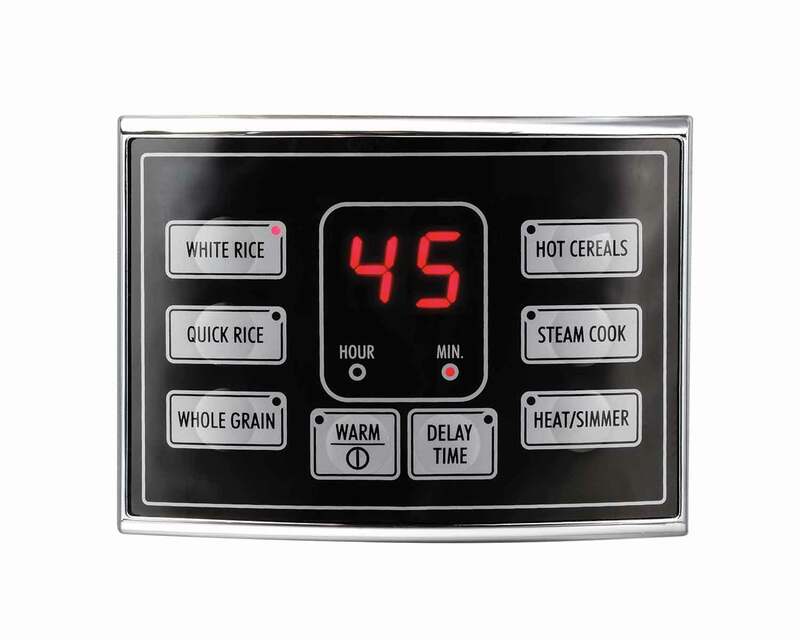 You can either manually set it for how many hours you want the food to cook and set for high or low. Then once it has timed out, it automatically clicks over to warm. That way the food doesn’t overcook or get too cold to serve. Another option is, if you’re cooking, say, a roast or a whole chicken or maybe a turkey breast, you can use the included temperature probe. You insert it through a hole in the top of the lid right down into the meat, set the cooker for the temp you want the meat to come to and when it reaches that temp, it shuts off. Again, no overcooked dry chicken breast meat or stringy pork roasts because you forgot them. I can honestly say I love this slow cooker. Yes, they sent me one for free, but my opinion is still honest. So much so that I’ll mention the ONE thing I didn’t like about it. The outside tends to get really hot, so you need to make sure this isn’t in reach of little ones.But other than that, I love it and have used it multiple times already. Guess what else? 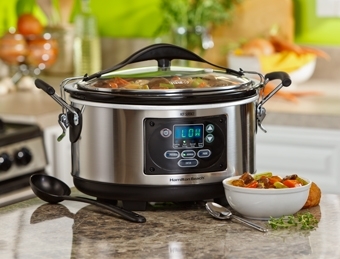 Hamilton Beach has graciously offered to let me give one of these slow cookers to one of you. This is a $59.99 value and it’s just in time for colder weather (or as a great Christmas gift to someone, maybe?) Plus, as the holidays get closer, we’re all going to be busier and you know darn well that having dinner on the table every night can be a hassle. So this is the perfect time to win this. All you need to do is enter down below by commenting and using the optional methods in the rafflecopter box. Tell me what would be the first thing you’d make if you won this and there is one entry! In a large pan, crumble and saute the ground chuck until brown. Drain and toss into the slow cooker. Brown the chorizo. Don’t drain this when done; just scoop it out and put it in the slow cooker. Toss the onions, green pepper and celery into the drippings form the chorizo. Stir to mix, cover and cook over medium heat until the onions and celery are soft and limp, about 5 to 7 minutes. Stir once or twice during the cooking. Add the veggies to the crock pot; stir to combine. Add all the other ingredients, in order given (makes stirring easier), then stir to combine. Set your slow cooker for 4 hours on low.. Halfway through cooking, open it up (make sure you’re quick; slow cookers lose heat quickly and can take quite a while to reheat back up) and give it a good stir. Re-cover it and let it finish cooking. I was provided with a slow cooker as compensation, but all opinions in this post are 100% my own! To enter the giveaway, just scroll down to the raffle copter giveaway form! Questions are supported by a toll-free call center located in the U.S.
We didn’t have a whole lot of luck with our tomato plants this year. It was such a wet, unseasonably cool Summer that they didn’t stand a chance. They would get decent sized and green, but few got enough sun to finish ripening. Out of about 12 plants, we got enough tomatoes for one session in the dehydrator, which we ended up eating like candy and enough for this batch of chutney. I can sincerely say that this chutney was worth the wait for ripe tomatoes. I’ve been canning for about 17 years or so now. I tend to stick to jams, relishes and chutneys. One of these days I’ll branch out and do pressure canning. I have the canner, just not the motivation or expendable cash. I keep saying that if I come across some fantastic sale on meat, I’ll can some, but who ever finds a fantastic sale on meat nowadays? Most of us are instead practicing meatless dinners a time or two a week because it’s so darned expensive to buy meat of any kind. 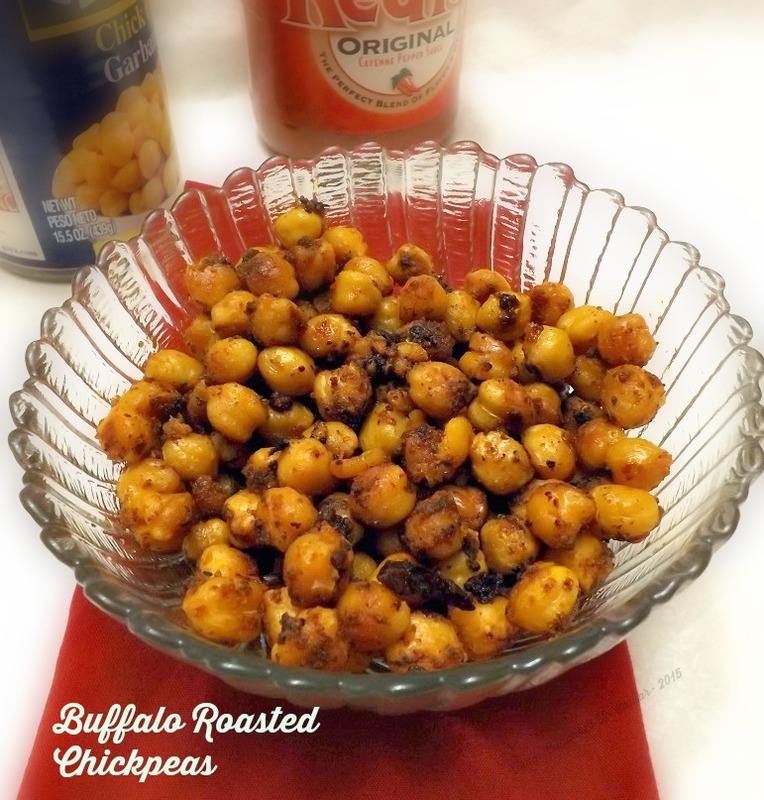 This has a decent amount of ingredients, but nothing hard to find and it all just goes into the pot together and cooks down, so it’s a fairly low maintenance recipe. I say again, as I’ve said before about canning recipes, practice safe canning, please. Do NOT listen to those who tell you it’s ok to just ladle the food into a jar, put the lid on and go on as if that’s sufficient for sealing. It’s totally NOT good enough. Even if the can seems to seal, you don’t know that it’s vacuum sealed, nor that any possible bacteria were killed. Never take that chance with your own health or that of your family. It’s too easy to do it right. 🙂 Here’s a link to show you how to properly can if you’re new to it. If you want to make this but don’t want to can it, you can also freeze portions of it. Just thaw when you’re ready to use some. Put all ingredients into a large, deep pot and stir well to combine. Bring to a boil over high heat, stirring frequently. Once it gets to a boil, turn your heat down to a barely medium setting (I do this at 4 on an electric stove) and let it simmer, stirring occasionally to prevent sticking. Cook until it has reduced to about half of it’s original amount and has become thick and rich looking, about 2 hours. If it starts to stick to the bottom of the pot at all, lower your heat a tad and make sure you’re stirring enough. Keep in mind that it will continue to thick a LITTLE bit even after you can it so don’t get it too thick during cooking. You want a product that is about the consistency of a loose preserve. Can as per the above directions (I got 4 1/2 pints out of this), leaving 1/4 inch headspace and boil in a water bath for ten minutes. When done, remove to a towel and leave undisturbed until cool. Check your seal and if any jars didn’t seal, store them in the fridge. The sealed jars can be stored in a cool, dark place for quite a long time. I like shortcuts. Always have. The problem for me in using shortcuts in real life, like say driving, is that I have absolutely no sense of direction. I’m that person who takes the same route to places every…single…time. Because if I don’t, I also become that person who is later saying “Honest, I MEANT to take three hours to get back home. I was looking at all the houses in this neighborhood. It was totally my plan to drive past each house 46 times before I got back onto the main road.” I have to take a route about 10 times, then I have it down pat and won’t change even if they have torn the road up, closed it down and are using dynamite to fix it. Better dynamite than lost in the desert for 40 years. I’m pretty sure the Jews back in Old Testament days wandered the desert for 40 years because someone suggested an alternate route. When it comes to cooking though, I love shortcuts. When you have six kids waiting for food approximately 15 times a day, you have to come up with ways to feed them quickly. Sometimes this means taking old tried and true recipes and *GASPS* using things that are a bit more processed to speed things up. 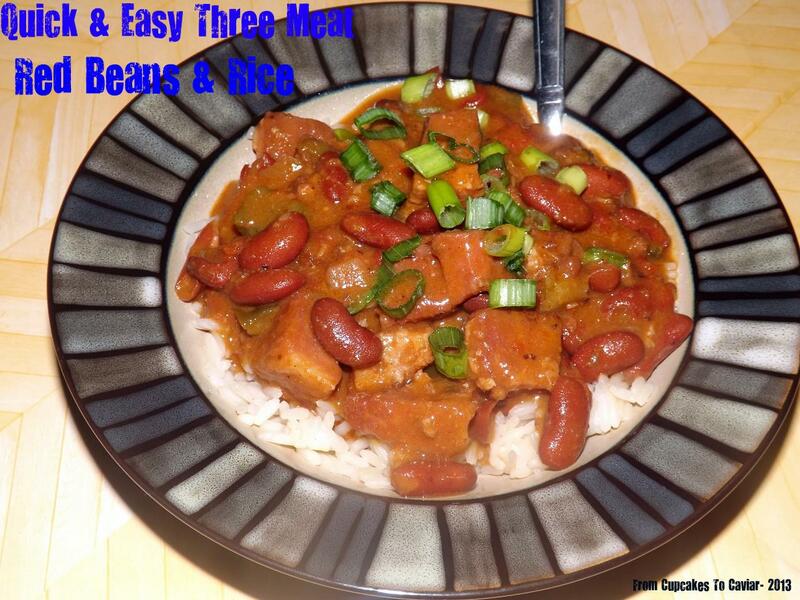 Case in point is this recipe for red beans and rice. Mind you, I love making them the old fashioned way; letting my dry beans soak overnight, making a 45 minute slowly browned roux and so on and so forth. Thing is, I have learned over 38 years of cooking (I started cooking when I was about ten) that sometimes, when you use shortcuts, you end up with a meal that is just as tasty as the old fashioned way. These beans are one of those times. Canned beans and a quick roux that’s made in the microwave (yes, you can do a roux in the microwave. Have I steered you wrong yet?) make this a weeknight meal that you don’t have to fuss much over. This is very meaty, filling and tastes fantastic. This doesn’t have a ton of extra ingredients. 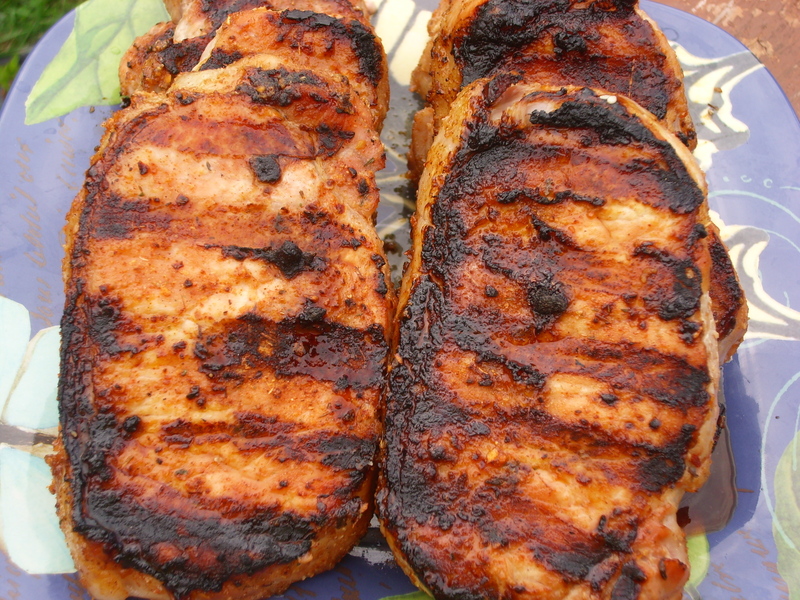 Between the meats, the veggies and the Cajun seasoning, this is extremely flavorful. You know the drill. Git to cookin’. Make your roux- in a large glass bowl (one that you know can handle time in the microwave, combine your flour and oil. Stir well. Microwave on high for 4 to 5 minutes, uncovered. It should be a nice light brown by this point and have a yummy nutty smell. Stir well, making sure to get the sides of the bowl. Microwave again for about another 1 to 2 minutes, watching through the door the whole time to make sure it doesn’t burn. By the end of 6 minutes maximum (unless you have a low wattage microwave, in which case the process will take longer), you should have a nice dark brown roux.. Carefully add your vegetables (and garlic) to the roux and stir well. Put back in the microwave and saute for about 3 minutes. Slowly stir in about 1/3 cup of hot water. In a large pot, over medium high heat, brown your meats, one type at a time. Do the ham first, then the andouille, then the chorizo. The reason for this is that chorizo has a stronger taste and you don’t want the other meats picking up it’s flavor but instead keep each meats distinct taste. Pour the roux mixture into the pot. Stir well, then add the beans, Cajun seasoning, tomatoes and hot sauce. Stir again, cover pot and simmer over medium heat, stirring frequently and lowering heat if necessary to prevent sticking. You can simmer this for as little as 30 minutes if you’re in a hurry or as long as a couple of hours. It’s a very forgiving dish. It’s also amazing a day or two later, reheated. Serve over bowls of rice, garnished with onions. Yesterday, I was having a conversation with friends on facebook about how the American public (and a few other westernized cultures) has gotten fatter and fatter even though there is a far larger variety of good for you foods to choose from. We went back and forth over whether diet or lack of exercise was the larger culprit with my personal stance being right in the middle of both. We make crappy food choices, then do nothing to work it off. As a society we have come so far from our agricultural work 10 hours a day at manual labor roots that’s it’s frightening. most of us now get our exercise at home via a dvd or at the gym or maybe jogging and that’s assuming we even get up off of our computer chairs to do ANYTHING. And as I said to friends, I’m as guilty of that as anyone. Case in point, chicken wings. I absolutely love them and would happily eat them several times a week with no problem. The problem lies in how I usually like them. I love the prepackaged bags of Hooters coating, frying the wings up all nice and crispy and then slathering them in the Hooters sauce. In my defense, I don’t have them often, maybe 2 or 3 times year, but to be totally honest, that probably stems more from the price of wings than any healthy living on my part. Like I said, I’m as guilty as anyone else. Last night, I had those same Hooters wings all planned for dinner. But after that conversation, I just couldn’t do it. I have been trying to eat better lately anyway (as I’ve said before, I actually don’t eat much of what I make for the blog… this is where having teenage boys and my husband having female coworkers who love sweets comes in handy hehe) and after my soapbox talk on facebook, couldn’t justify fried wings coated in flour and a buttery sauce. Preheat oven to 400. Line a large baking sheet with non stick foil (you could also use regular foil but spray it with cooking spray… as much fat as wings render, they still stick to the pan). Place the wings in a single layer on the baking sheet. Bake at 400 degrees for 20 minutes, then drain off all of the rendered fat or your wings won’t crisp at all, they’ll just steam in their own fat. Continue baking at 400 until wings are cooked through. If they haven’t browned enough for you, turn your broiler on high and put the pan under the broiler until they are of desired brownness. Watch closely so they don’t burn. As the wings cook, make your sauce. In a medium non stick pot, combine all the sauce ingredients. Bring to a boil over medium heat, stirring constantly so it doesn’t burn while the preserves melt. Once it is smooth, turn the heat to medium and continue boiling, stirring very frequently to prevent sticking. Turn the heat off about ten minutes before you take the wings out of the oven to let the sauce cool and thicken. it will look thin hot, but will thicken nicely as it cools. 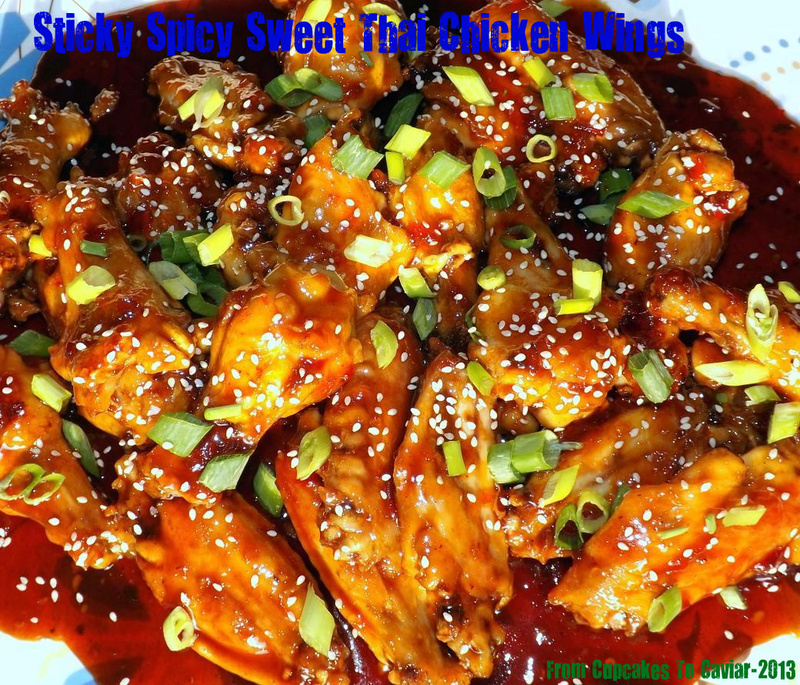 Put your cooked wings in a large heatproof bowl and pour the desired amount of sauce over them. Toss to coat. Garnish with sesame seeds and sliced green onions. Whoa. I just passed over into “Long Recipe Name Land”, didn’t I? But I had to!!! Honest injun, ma! Fried Fish Po’ Boy sounds b…o…r…i…n…g… and while the fried green tomatoes added kicks the name up a notch, you really really NEEDED to know about the homemade lemon herb tartar sauce (on a side note, am I the only one who was thoroughly confused as a kid by tartar sauce and tartar on ones teeth? I was convinced that you got bad teeth because you ate tartar sauce. Please tell me I wasn’t alone in my idiocy *hears crickets, dies of embarrassment*) because it’s really what sends this sandwich over the edge from “I saw 5000 po’ boys on google” to “Oh! Where did I see that one po’ boy that had that amazing tartar sauce!? Oh yeah, it was on From Cupcakes To Caviar!”. It is creamy and tangy and a bit zesty from the lemon and the red pepper with a wonderful herbed flavor from…well, the herbs. Duhhhh, mannnn. I would have liked to use catfish on this because I love catfish but catfish costs as much as a mortgage payment anymore if you’re in a landlocked state so I used Tilapia. Feel free to use whatever mild white fish you like in this. Any of them will work. This is extremely easy. Just get your tartar sauce made at least an hour ahead of time to give the flavors time to blend and taste it to make sure it to your families liking. Get your prep work done (veggies ready to go on the sandwiches, side dishes ready etc) and all that will be left is frying the fish and the tomatoes, letting everyone put their sandwiches together and chowing down. You know the drill… get to cookin’!! Make your tartar sauce- In a small bowl ( a cereal bowl is big enough) combine mayo, pickle relish, 1 tablespoon lemon juice, one tablespoon lemon zest, dill weed, chives, red pepper or hot sauce and salt. Stir well to mix, taste for seasoning then cover with plastic wrap and refrigerate. In a medium bowl, combine the flour, cornmeal, and the next 7 ingredients (up through the cayenne). In another bowl, combine the eggs and cold water. In a large skillet, over medium heat, heat your oil to between 335 and 350 degrees. As it’s getting to temp, bread your fish. Dip first in the egg mixture, shaking off the excess, then dip into the flour/cornmeal mixture. Gently lay the fish, about 3 to 4 at a time depending on size, being careful not to crowd the pan, into the hot oil. Let cook until golden brown on one side, about 3 to 4 minutes then flip. Let the other side brown well then remove from pan and lay onto a paper towel lined plate. Unless your fish is exceedingly thick, letting it get nicely golden brown on each side will be enough to get it cooked through without overcooking it. Cook all the fish, then do the same procedure with the sliced green tomatoes. With the tomatoes however all you need to do is get them brown. No worry about actually getting them cooked. 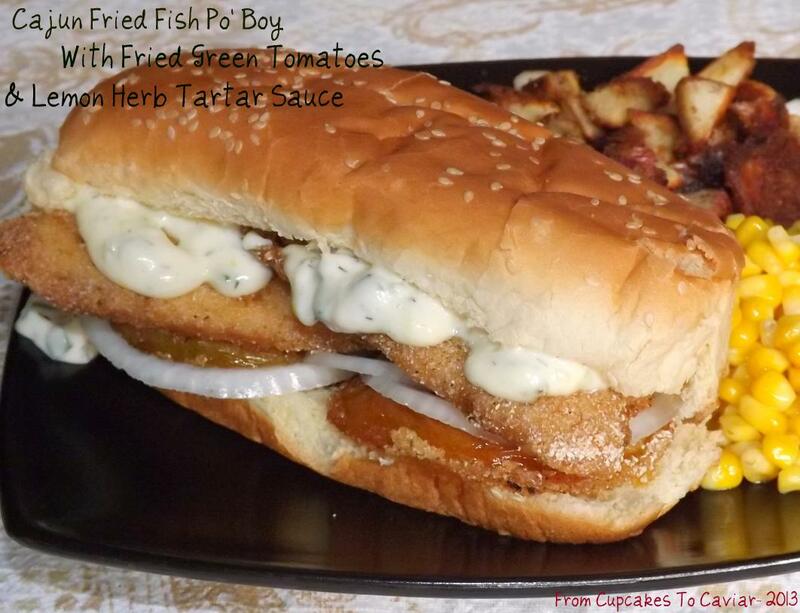 Lay everything out- fish, tomatoes, tartar sauce, rolls and garnishes and let everyone put together their own po’ boys. Some of you who may have seen how tickled I was a few weeks ago when I realized that Andrew Zimmern started following me on Twitter. Fine, tickled may be an understatement. I about peed myself. The only thing that prevented that was the fact that my other pair of clean jeans was the washer. Mind you, he follows about 24 thousand other people too but considering that over half a million follow HIM, that still made me about one in 20 or so whom he follows back. That means we’re bff’s right? Yes, I realize that maybe it was an underling who followed me or that Mr. Zimmern said one day “Hey, underling, go find some really really bad food blog and follow it. I need something to make me laugh.” The underling then found me, followed for him, then got promptly fired when he realized that Mr. Zimmern didn’t mean to follow one quite THIS bad. But in the spirit of hope, I prefer to believe that somehow, my wit and pithy sense of humor (oh God, I’m killing myself here *snorts and laughs*) brought me to his attention one night when he’d had too much to drink and he decided I was a cool person to keep up with. So, in that spirit, I am writing him a short letter here. Can I call you Andrew? How about Andy? Ooo, ooo, I know! I can call you Ang just like Barney Fife called Andy Griffith. It’s what bff’s do, right? Come up with nicknames? So maybe now you can call me “Cool J”. *Does the “Cool J” gangsta finger thing* Owowowowowowwwww… finger cramp. No, no, no, it’s ok Ang, I’m cool. Cancel the plane flight. Just a minor *sobs* finger cramp. So, how’s it going? I almost asked “how;’s it hangin'” but then thought that maybe a female bff shouldn’t ask that of a male bff. Wait… does typing it out anyway mean I still asked it anyway? Crap. Sorry. I can’t help but wonder how you came to follow me on twitter and probably come to my blog a few times a day hoping for updates.? Was it the fancy cooking? Maybe the Blueberry Cornmeal pancakes? Or the video of the Monty Python intro!? I know! It was my world class photography! I feel like I need to make some cockroach (hehe..like my play on words here? ?Huh huh huh?) testicles to make sure I keep you happy. But I didn’t have that on the menu until next month. It takes a while to stockpile enough of those bad boys to make a meal. Plus, if you don’t wrap them in something bright, the bag is too small to find in the freezer. But whatever the reason, I just wanted to let you know how pleased I am that we will now be lifelong buddies. I’ve always admired you, love your show(s) and recipes and had always thought that you were the kind of guy I’d love to invite over (and Mrs. Ang of course) for a beer and some roach testicles. But in the meantime, I made one of your recipes today. It got a unanimous thumbs up even though I accidentally used too much chipotle pepper and none of us have any taste buds left. In a large non stick pot, heat the oil until shimmering. Add the bacon and cook until the fat has rendered out. Using a slotted spoon, put the bacon aside for now. Eat the 90 extra pieces you accidentally tossed in the pot. Season the pork to taste with salt and pepper. Add it in batches (you want to sear the meat, not steam it in it’s own juices and grease) to the pot and cook until browned, about 7 minutes. Set aside as you get it browned. 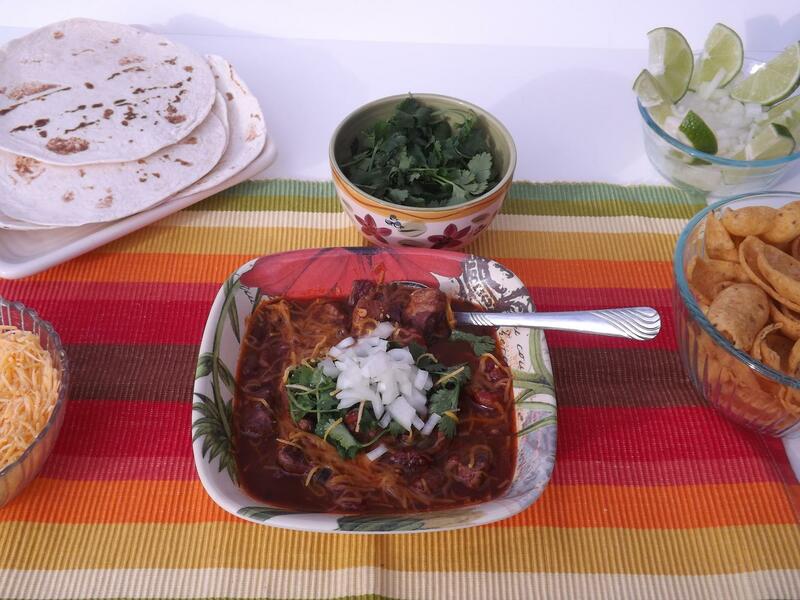 Add the poblanos, onions, chipotles and garlic to the pot and cook over medium heat until the onion has softened. Add the chile powder, cumin, oregano and cilantro and cook until fragrant, about one minute. Add the tomatoes, beans, chicken stock, beer, brown sugar and bacon and bring to a boil. Cover, reduce heat and simmer until the beans are just tender, about 90 minutes. Uncover and continue to simmer until the beans are totally cooked, about another 45 minutes. In a small bowl, whisk together the corn flour (please don’t sub regular flour. You can get the corn flour in the Hispanic aisle of the grocery and it adds a flavor regular flour won’t) and the water. 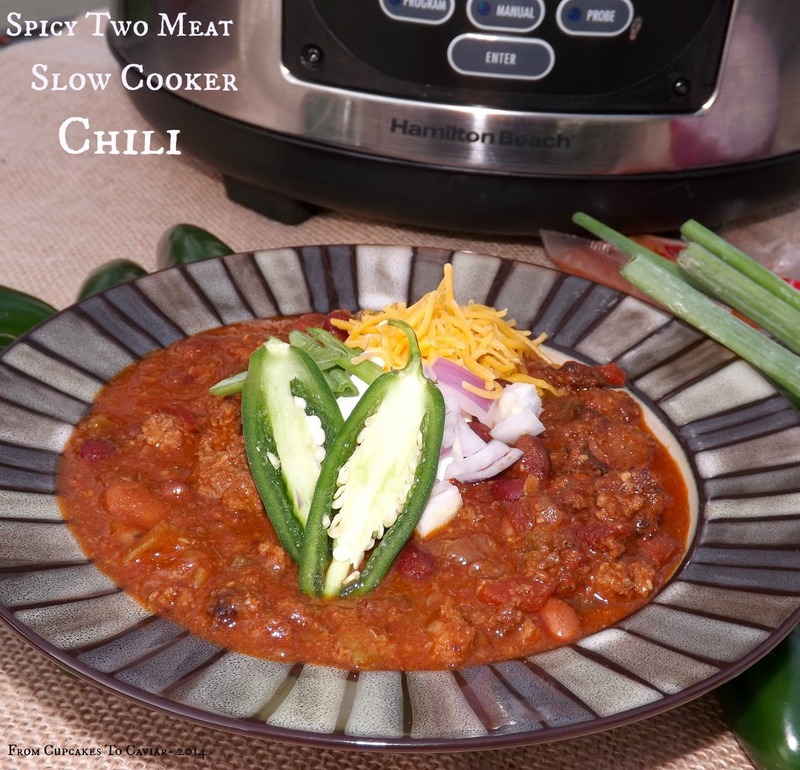 Slowly whisk the mixture into the chili. Add the lime juice and zest, season with salt and pepper and serve with sides of tortillas, cheese, onions, whatever you love with chili. Just stay away from the leftover chipotles… trust me.